Sardito & Teniente are a military themed couple. One fall opener. Power Bull replaced Dragon Celestial. Aeroman beat Aztlan with a Canadian Destroyer. Gym Hip Hop (Sonic) beat Gym Zeuz (Toxin Boy) after Espada de Plata’s mask was pulled without the ref noticing. Bloody match. Atomic Star & Electro Boy ran out to help Eterno, with Aeroman & Power Bull making the save. Terry tried to use that distraction to foul Eterno, but the referee caught him and called for the DQ. is the DHC 342 a music thing or a lucha thing? The t-shirt style is modeled after the RUN DMC ones, but Eterno’s guys all appeared to be wearing those shirts. father and son tags. Debut of Rafaga Jr. here – he’d been in a 2013 indy version of this match (with the Javier Cruzs, Centellas, and Esfinge/Magnum) Furia Roja Jr. and Centella are also making first appearances (or first appearances in a long time.) Match came down to Rafagas vs Esfinge/Mangum, only Centella attacked Malefico when it appeared as though he was about to win for the DQ. Centella is on the card next week, so it looks like they’re running a feud with him and Magnum. to recap: CMLL didn’tk now who was held a belt, and would like us to care about someone else winning. Exciting times. They also brought out the En Busca de un Idolo participants, apparently to make it clear to everyone that isn’t going well. That may be a little bit of my cynicism, but it reads like those in the tournament feel the same way or even stronger. Tony Salazar started off the segment by criticizing all the luchadors performance so far. That apparently angered Disturbio (though another report says Salazar actually praised Boby and Disturbio.) Disturbio ripped Tirantes for complaining about the physical fitness of luchadors when he hasn’t wrestled in years (and is in worse condition) and mocked Shocker for doing the same Shocrates quote bit before each segment. (Hijo del Gladiator was not mentioned by name in the CMLL recap, but it was said he was against all the judges.) Disturbio complained that the judging comments didn’t make any sense. Disturbio ridiculed the judges for pushing the competitors towards mat wrestling, saying the fans are used to a more exciting style and boo when they keep it on the mat because the expectations have been raised so much. And Disturbio accused the voting form of not registering votes correctly, with votes sometimes not counted at all. (Imagine if someone told him how easy it was to vote a 100 times for someone.) Disturbio said he was tired of being in the openers, tired of being told ‘a luchador should be content with any position on the card’, and he’s going to just smash anything that’s in front of him. Very few other luchador comments were recorded, outside of Delta blaming his knee injury on his performance and Zavala & Maya being happy with their position. Pretty much everything Disturbio said has been said by people watching the tournament, almost point by point. In almost any other promotion, this would likely be part of a reality based angle. In CMLL, Disturbio probably was actually really angry, picked an interesting time to air his grievances, but it may not publicly go anywhere (outside of maybe now getting trashed by the judges.) Intentionally or not, angle or not, Disturbio positioned himself as an anti-establishment choice, and 2015 is a pretty good year to be anti-CMLL establishment. The same press conference announced a 07/10 luchadora cibernetico, in honor of ten years of the the current incarnation of the women’s division. The lineup was said to be a twelve person match with Amapola, Zeuxis, Seductora, Tiffany, Dalys, Estrellita, Vaquerita, Princesa Sugehit, Marcela, Silueta, Dark Angel and Goya Kong. The last three weren’t at the press conference. It does mean Dark Angel is expected back next month. We know a little bit more about the All Elite mystery person situation. Shelton Benjamin (or Benjamin Shelton as listed on the poster) has officially been added to the card, though All Elite hasn’t said which match he’ll be in. Likewise, they held a press conference today and announced Juventud Guerrera would be on the show. It also appears Davey Richards & Bobby Lashley were actually booked for the show at some point; the Wrestling Observer confirms Davey got himself double booked but will be working the TNA show. Lashley is also on the TNA PPV so he won’t be in All Elite. All Elite not announcing the mystery men might just be because they haven’t figured them out quite yet. Hernandez will be working the show: the same newsletter says AAA/LU wrestlers are (now?) prohibited for working for Liga Elite because AAA sees that as competition and so Hernandez must’ve no longer be working with LU. Tigre Uno won TNA’s X Title last night. That’d indicate he’s also working the TNA PPV this Sunday (and not All Elite) and probably also that they’re not hoping to get Rey Mysterio Jr. and are going with someone else as their latest big Latino star. I don’t know if this is a YouTube error or something weirdly related to the TNA/GFW thing, but the Jeff Jarrett/Johnny Mundo/Cage/Averno attack on the tecnicos from the Lucha World Cup TV show is now marked private on YouTube. You can still see it on my channel. 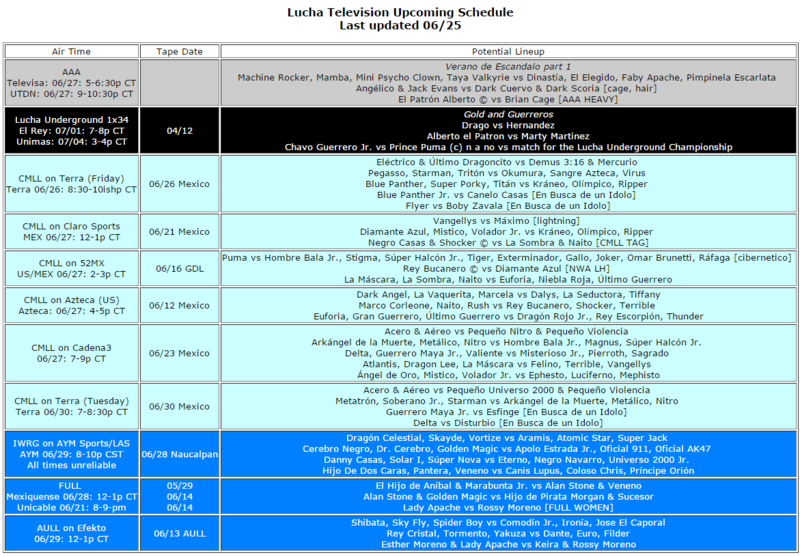 NJPW World has video of the 06/19 Marco Corleone, Naito, Rush vs Rey Bucanero, Shocker, Terrible. That’ll air on Azteca next weekend. Maybe they haven’t gotten to Sunday yet? I guess I have to hold on for a couple more days. The All Elite Guadalajara show airs again tonight. If you’re Guadalajara, I’d love to get a copy. Black Terry Jr. has highlights of Caifan vs Virus and Rey Hechicero vs Pagano. LuchaWorld has KrisZ’s news update and a recap of a good interview with KeMonito. Mini Psycho Clown is excited for his big title match this weekend. Dinastia says the AAA mini title is the most important mini title in Mexico, and he wants to leave Orizaba with it. The lucha libre commission and the Mexico City education department announced a program to help luchadors finish their primary and secondary education. Lestat, Rey Samurai and Arkalis want to be a a regular trio. Kcidis draws Rey Escorpion vs Ultimo Guerrero. 5) Chica Ye-Ye, Jimmy, Kevin vs Destello, Joven Maravilla, Maremoto Jr. This is the last show on the three day DTU swing, though the first to turn up. The Rotation arrives from Germany’s WXW.